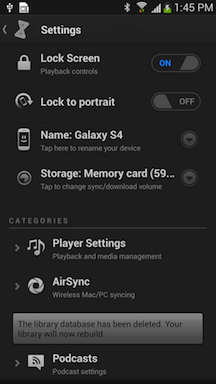 To switch between internal storage and the external memory card on a dual storage device like the Samsung Galaxy S4, please tap on the icon in the upper left to slide out the Menu. 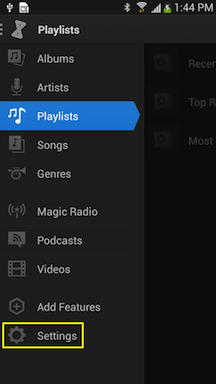 You can also tap and drag-right to slide the menu out. Then tap on "Settings". 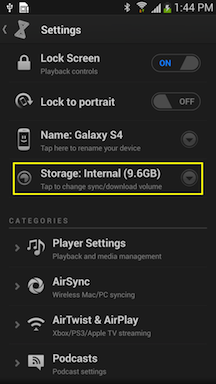 Then tap on the "Storage:". This switch will tell the computer application which volume to display for syncing. 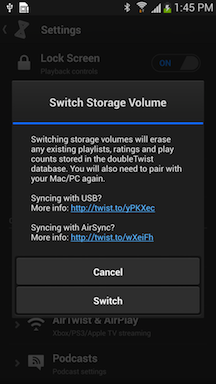 Select a storage location and then tap "Switch" to confirm. The library database will be deleted. Please wait a few minutes for it to be rebuilt. We recommend only using one volume to store your media. 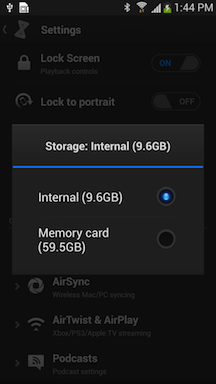 If you choose the memory card, please do not store media files on the internal storage location as this will cause errors during the sync/import process.